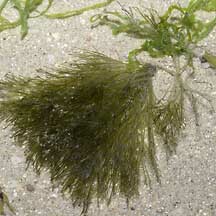 There may be different forms of this seaweed from hairy to feathery. Take a closer look. Avoid stepping on the green carpet of hairy seaweeds. It's slippery and animals live among the seaweeds. 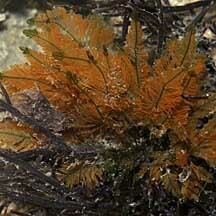 Tiny animals are often found in this seaweed. Look for them. Where seen? 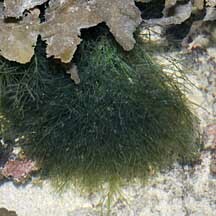 This green seaweed is commonly seen on many of our shores, attached to coral rubble. Sometimes in small clumps on sandy areas too. It seems to be seasonally abundant, especially on our Southern shores. 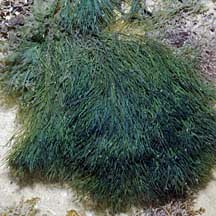 At times, vast areas of the intertidal zone may be blanketed in a thick green carpet of this seaweed which disappear after a few weeks. These blooms are suspected to be related to high nutrient concentrations. 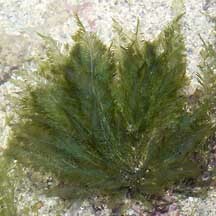 It is reported that this seaweed can tolerate low salinities. Features: A clump of fine filaments (6-8cm long) attached to a hard surface, such as small stones and coral rubble. 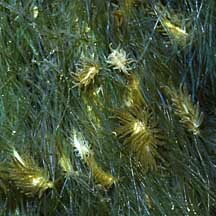 In some, the filaments form long feather-like structures that taper at the tips. In others, the filaments are long, single strands with only a little bit of branching. Various shades of green, from bluish green to olive green. 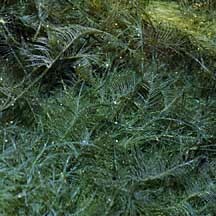 According to AlgaeBase there are more than 60 current Bryopsis species. 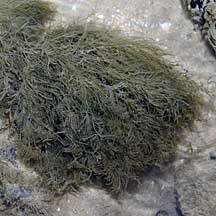 Sometimes confused with similar green seaweeds such as Turf green seaweeds (Enteromorpha sp.) and small turfing species of Cladophoropsis. Role in the habitat: Although some Bryopsis species produces chemicals to defend against herbivores, when hairy green seaweeds are abundant on the shores, there is also an abundance of some sea slugs such as the Leaf slug (Elysia ornata) and tiny Bryopsis slugs (Placida dendritica).These sap-sucking slugs probably eat the seaweed. 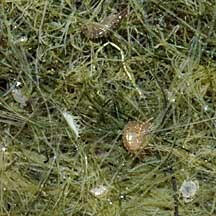 Sometimes, the seaweed is thick with tiny little beachfleas (Order Amphipoda). 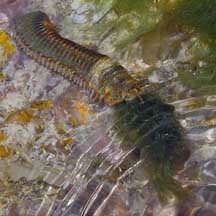 We have also seen the Giant reef worm (Eunice aphroditois) snatching this seaweed back to its lair. in a thick furry blanket. a mouthful of seaweed back into its lair. often seen on this seaweed. often abundant on this seaweed. Sometimes parts may be orange. *Species are difficult to positively identify without close examination of internal parts. On this website, they are grouped by external features for convenience of display. Pham, M. N., H. T. W. Tan, S. Mitrovic & H. H. T. Yeo, 2011. A Checklist of the Algae of Singapore. Bryopsis: who eats this algae? on the Sea Slug Forum: a compilation of messages about slugs that eat Bryopsis. 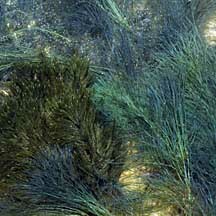 Bryopsis on AlgaeBase: Technical fact sheet. Lee Ai Chin, Iris U. Baula, Lilibeth N. Miranda and Sin Tsai Min ; editors: Sin Tsai Min and Wang Luan Keng, A photographic guide to the marine algae of Singapore, 2015. Tropical Marine Science Institute, 201 pp. Pham, M. N., H. T. W. Tan, S. Mitrovic & H. H. T. Yeo, 2011. A Checklist of the Algae of Singapore, 2nd Edition. Lee Kong Chian Natural History Museum, National University of Singapore, Singapore. 99 pp. Uploaded 1 October 2011. [PDF, 1.58 MB]. Huisman, John M. 2000. Marine Plants of Australia University of Western Australia Press. 300pp. Calumpong, H. P. & Menez, E. G., 1997.Field Guide to the Common Mangroves, Seagrasses and Algae of the Philippines. Bookmark, Inc., the Philippines. 197 pp. Trono, Gavino. C. Jr., 1997. Field Guide and Atlas of the Seaweed Resources of the Philippines.. Bookmark, Inc., the Philippines. 306 pp.